St. George’s Church, originally uploaded by bill kralovec. In the spirit of Britian’s Royal wedding this week, we visited the Serbian royal family’s Mausoleum and museum complex in the small town of Topola, Serbia. Topola means “poplar tree” in Serbian and is located in the heart of Šumadija, the forested center of Serbia. This is the place where the founder of the Serbian Royal Family, (Karadjordjevic), the famous “Black George,” started the first uprising against the Ottoman Turks in 1804. 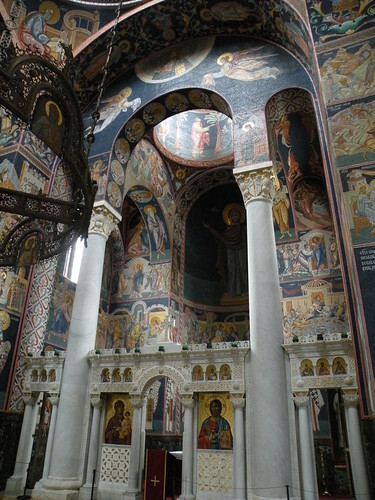 A later descendent of Black George, King Petar I, began construction of a church in 1910. The project was interrupted by World War I, and he died before it could be finished. His heir, King Alexander II, oversaw its completion. The church was dedicated to St. George in 1930. The church is on the peak of a small hill called Openlac near the original homestead of Black George. Masses were held there until 1947, when the Yugoslav government declared it a cultural landmark. Underneath the church is the Karadjordjevic family mausoleum. There are 19 members of the royal family buried there, including Black George himself. It is an amazing building! There are 725 mosaics on the walls with a surface area of 3,500 square meters. The 40 million pieces provide the whole continuum of color, and the scenes depict either Bible stories or Serbian history. 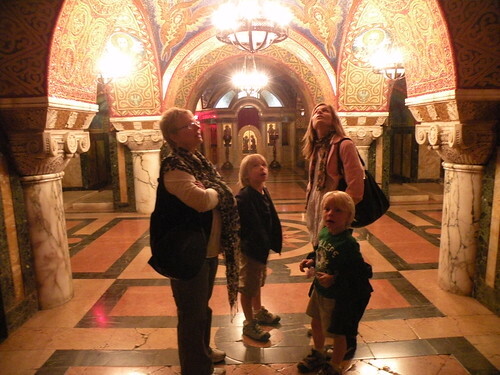 We were in awe walking through the place, with light striking at different angles. I highly recommend visiting the church. The area surrounding the church is also beautiful and a perfect place for a picnic. Openlac in Serbian means the wooden pieces of carts. The wooded hill was used for centuries for wood collection by the locals. It is all preserved, including the vineyards of the royal family. It makes an ideal day trip from Belgrade. We also made the obligatory stop at the Aleksandrovic Winery, located 5 kilometers south of Topola. We tasted and purchased some of their wines, although we were a bit disappointed in the higher costs of the bottles. They used to be half the price of what you could buy in the supermarket in Belgrade. They are now 2-3 Euros cheaper and not worth the drive.